I hope your week is going well so far...it's always nice to start with a Monday holiday! 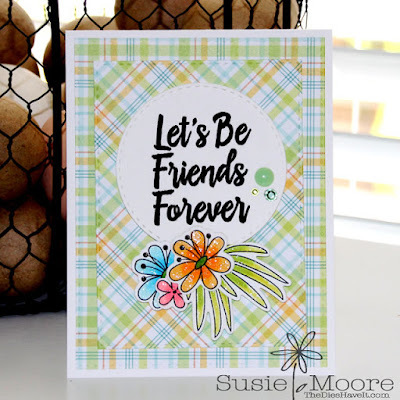 Today's card is completely made with stamps, dies and papers from MFT Stamps. I absolutely love the way this company comes up with fresh new designs each month. They inspire me so much. If you haven't taken a look at their site recently, it's time now! Do it....you'll be glad. Have a great Tuesday and I'll see you tomorrow. Susie that is such a sweet card with the pretty plaid paper and those happy flowers - love it!